Parsons: "More effort needed here." He makes a "plagiarism" charge and gives it a "B-", 65/100. 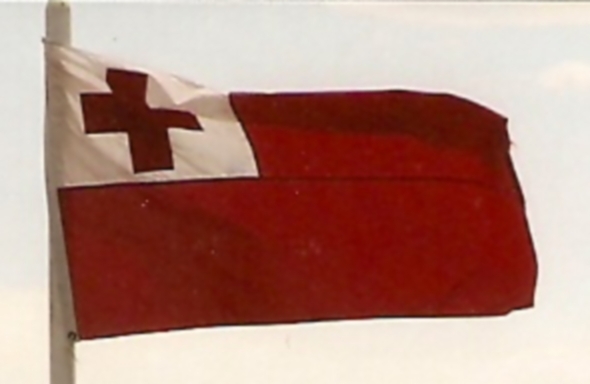 Michael5000: Tonga's flag is a distinctive, one-of-a-kind design that nevertheless falls well within the constraints of traditional flag vocabulary, so I've got no idea what Parsons is on about here. Maybe he thinks there's too much gesturing towards Switzerland, but that's a bit of stretch. So yeah, I have no problem with design integrity. I do, however, find the design kind of boring. Parsons: With "bad colours," it gets a "B-", 65/100. Parsons: "Nice design," says Parsons, "but this star and crescent features a particularly bad astronomical impossibility." There's also a "plagiarism" charge tacked on, but it nevertheless gets a "B", 70/100. Michael5000: Yeah, those are symbols, not a pictorial representation of an astronomical event. 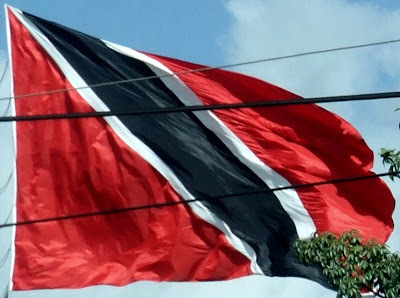 I think the central device could stand to be a little bigger relative to the flag as a whole, but all in all this is one of the more handsome banners in the region. Parsons: It's "simple," and gets an "A", 85/100. 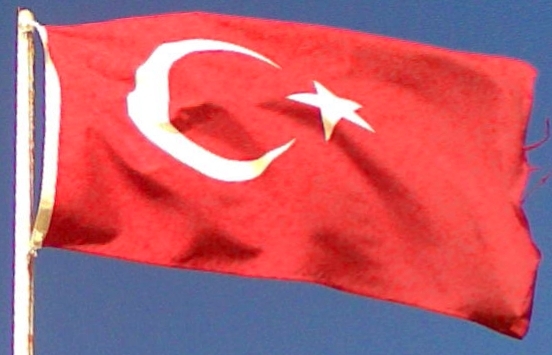 Michael5000: The similarity to Tunisia's flag is obvious. Tunisia's is better. Parsons: It is "eyewatering," has "too many stars," is "too busy," and "makes [him] nauseous." "Flag actually includes a Persian (sorry, Turkman) carpet," he adds. 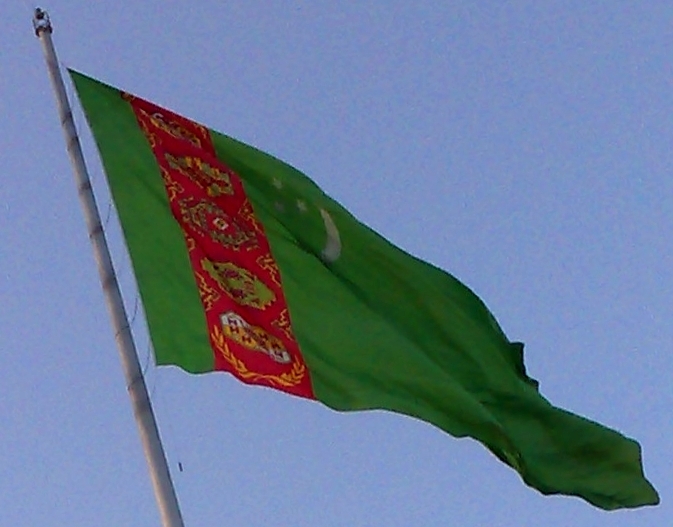 "Only flag to both make eyes water and induce vomiting." He assigns a "D-", 37/100. Michael5000: By the letter of the fussiness law, the frimframery of the Turkmen and other Central Asian flags ought to bug me. They fail the Betsy Ross Test with too many flying colors. Except, that stripe represents the kind of fiber arts that the local Betsy Ross set actually practice. This kind of flag merges an indigenous tradition with the European flag concept and comes up with something that I actually find kind of cool. How does it look on a pole? 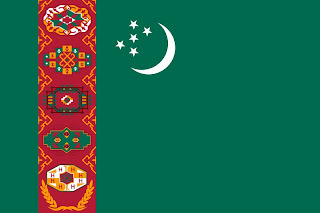 Belarus and Turkmenistan's flags seem to definitely be related (the European and Asian takes on each other), and indeed their countries are similar too (both former Soviet states, both dictatorships (although, with Nazarbyev's death (guessing at spelling, doing it from memory) a few years ago, Turkmenistan may be out of the dictator's club). There also seems to be similar reaction on each flag from both you and Parsons (you love, he hate). Oh, and I'm positive Tunisia's was a takeoff on Turkey (Turkey's flag predating the Tunisian state by centuries), not the other way around. Tonga's is serviceable, but boring. Flags with cantons, especially with a plain body, are not my favorite. B.
Tunisia's is nice (A- to A)); I agree about the size of the device - and maybe it could be moved hoistward. I'm going to have to disagree with you on Turkmenistan. It actually doesn't look good flying to me. I think it looks better flat. It is in serious need of simplification, and those colors could use a little separation. I wouldn't say it makes me nauseous, but it's got issues. D+ to C-. At least there's no writing. dh: Yes, Tunisia's flag derives from Turkey's; Tunisia was part of the Ottoman Empire. I talked about Tunisia's first due to the tyranny of alphabetical order. I feel, in opposition to our colleague Mr. X, that Tunisia's is an improvement on the theme. I don't get Parsons when he says that Trinidad has Bad Colors. Red, White and Black?? Great colors, and great diagonal with stripelets!